Sudy Samandari is co- founder and editor-in-chief of Zan Magazine, a national magazine, the very first of its kind, dedicated to modern Iranian-American woman. Born in Iran and based in Houston, Texas, Sudy comes from a family with a strong tradition in journalism. Her late father was the publisher of Golchin in Houston for 20 years. 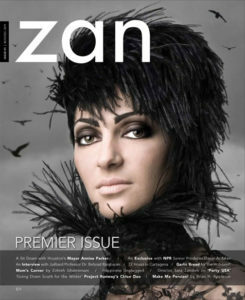 Zan, (which means woman in Persian) was launched in November of 2011, covering a wide range of issues including fashion, society, culture, leadership, and literature. Influenced by Sudy’s strong family tradition in publishing, Zan has built a reputation for its strong use of visuals, creative colors and art work. It also enjoys content contributions from prominent Iranian-American writers. Zan has won ads from a number of brand names in the country and is planning to win more from some of the nation’s strongest brands as it strives to build a greater base of national readership beyond the Iranian-American community. How long have you been working on Zan Magazine? 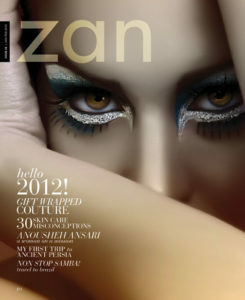 The inspiration for the Zan came to me in early March 2011 and with the dedication of our visionary Zan team we were privileged to launch our Premier Issue on 11/11/11 ! What motivated you to launch Zan? What was the rationale behind it? The birth of Zan came from combination of two different fundamentals for me. The first was the fulfilment of my own personal pursuit of finding my “purpose” in life — the ability to make a difference. The second fundamental was the recognition of the necessity of such undertaking to fill a need or a void in our community. You see my beloved late father, Abdollah Samandarizadeh, the founder and publisher of Golchin for 20 years, had found his passion and his rewards in his cherished magazine and by putting his heart and soul into his purpose he got to realize his dream of “making a difference.” Of course, witnessing the amount of time and commitment that went into creating a magazine every month was enough to make me decide not to ever want to do that myself! Never say never! But seriously, what motivated me even further was when I started talking about it. The response was truly overwhelming, especially the reaction from the younger generation for whom I have the utmost respect. These young women (and a few young men) immediately embraced the idea and declared their total devotion. Well, if nothing else, that alone sealed the deal for me! Were you born in Iran? If so, how long did you live there ? When did you move to the U.S.? Yes, I was born and raised in Tehran and left home when I was eighteen. I went to England for three years and then moved to the United States in 1982. I have been an entrepreneur for the last 25 years but always a journalist and a writer at heart! You can say I am one of those lucky people that eventually found their passion and their calling in life! Do you expect support for Zan from the Iranian-American community? Undoubtedly, Zan is dedicated to modern Iranian-American women and judging from the overwhelming response, it has already hit a nerve in our community. Research shows that people tend to support and nurture what they consider a necessity and Zan is a national magazine, the very first of its kind, that fits the description of filling the gap for the educated Iranian American women and men as a platform and a medium to reflect their lifestyle and desires. Do you think large brand names will be interested in running ads in Zan? Yes, I am confident that will be the case, as Iranian-Americans are above the national average in both education and income levels, and as we know, women in general have a greater say in each household as to how the money is spent! Additionally, our goal is to continue producing the kind of magazine that will draw great advertising on the merit of its own quality, as thus far it has done so with the likes of Rice University and DeSimone, to name a few. What do you think of the new generation of Iranian-American women? Oh, they take my breath away! I am always in awe of their intelligence and their layered minds. I have always thought that our younger generation of Iranian-American women and men are truly rock stars in the overall American society. They are educated, bright, confident, and outspoken. Unfortunately, when it comes to the Iranian community, I suspect many of them feel they don’t have a voice; that they’re not taken as seriously. No wonder they inevitably tend to withdraw and feel they can’t blend in or belong. My main vision and highest hope in creating Zan is to give this dynamic generation a voice and a safe haven to express themselves freely. It has certainly given me an edge by providing me access to the phenomena of living in a true multi-cultural environment. On one hand, the opportunity of intermingling in the American community at large and taking advantage of all that’s there for grabs; on the other, the desire to hold on to the core of the Iranian heritage and culture has been an interesting balancing act. No wonder we are all such multi-taskers! Who would you name among some of your main source(s) of inspiration in your career? First and foremost, my beloved late father lived his life by precisely what he preached — freely and fully with no limitations and no fear of speaking his mind. He is truly my role model and my hero in every sense of the word. Second, ever since the journey of Zan has begun, every day I get blown away with the intense creativity and the fierce intelligence of Zan’s managing editor Dr. Baharak Sedigh. She is truly an enormous source of inspiration and a moving forward “X-Factor” for Zan. Yes, I am. I have one son, Kian. He’s a handsome 14 year old! I’m a born optimist, but I have to say it’s very hard to maintain that sentiment after what we went through in Iran. Unfortunately, one of the very first by-products of any gravitation towards an Islamic system is the direct negative impact it has on women’s status and social freedoms.